San Francisco 49ers quarterback C.J. 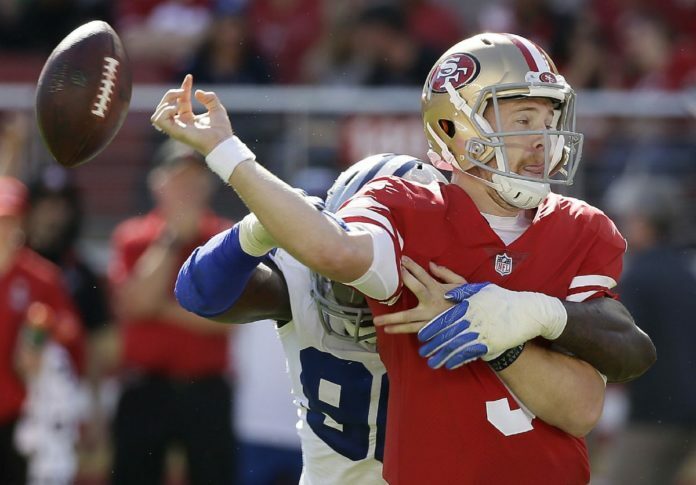 Beathard (3) fumbles as he is hit by Dallas Cowboys defensive end Demarcus Lawrence during the first half of an NFL football game in Santa Clara, Calif., Sunday, Oct. 22, 2017. The Cowboys recovered the ball. Cowboys quarterback Dak Prescott spoke to the press on Wednesday wearing a unique hoodie given to him by defensive end DeMarcus Lawrence. The white sweatshirt read “Tank is coming for you” with an animated Lawrence chasing behind the starting quarterbacks for the other three teams in the division: the Washington Redskins’ Kirk Cousins, the Philadelphia Eagles’ Carson Wentz, and the New York Giants’ Eli Manning. Lawrence, who also goes by Tank, gave a hoodie to each of his teammates last week. He is also selling them. He leads the NFC with 9.5 sacks on the season, putting him on pace for one of the best seasons for a defensive end in NFL history. He also has three forced fumbles through six games. His performance is coming in a contract year, meaning next season he will likely become one of the league’s highest-paid defensive players. Prescott, a star player with plenty of his own merchandise, was more than happy to help Lawrence with publicity.